If your Olly is crashing when loading executable protected by VMProtect, you most likely have outdated dbghelp.dll somewhere on your path. Grab the latest version from Microsoft and put it in the Olly folder. Well, that might be enough to work around the issue that I had - but I still wanted to know what's causing the crash. For some reason, value in EDX is garbage and therefore access violation happens. So, it's debugging time! 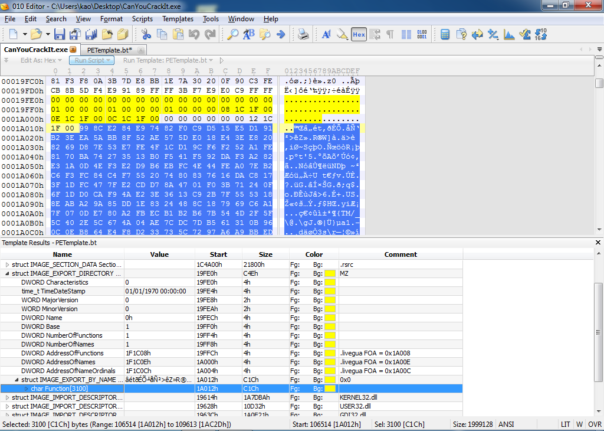 Set breakpoint to start of LoadExportSymbols, then set hardware breakpoint on write to address [ebp+ptrAllocatedMemory]. Good folks at Microsoft have left us with a nice buffer overflow. exportFunctionName is defined as byte array of size 2048 bytes. Any exported function name longer than that will cause stack overflow and (possibly) subsequent crash. P.P.S. CFF Explorer, HIEW and IDA do not show us any exports in this example file - but that's a matter of another story..